A toothache is often a symptom of a bigger problem in the mouth that will need to be addressed, or the problem may get worse, and treatment becomes more complicated and expensive. If you are in need of immediate attention, give us a ring, and we’ll do all we can to see you on the day to stop the pain. If you are unsure if this is an emergency, our highly trained team members can guide you on what to do and the next step for you to take. It will also be wise to purchase over the counter pain relief to manage the pain until we can treat the root of the problem. Record the nature of the pain, location, severity and when the pain started. The information provided will allow us to make a diagnosis quickly and get you out of pain fast. We will then perform a comprehensive exam and discuss the options with you. Cracks and fractures can occur from injuries, grinding, clenching or severe decay. These can be very painful when biting down or releasing pressure as the jagged edges of the cracked tooth can rub against internal pulp. This agitation can be harmful to the inner pulp. If left untreated, you may require Root Canal Therapy. Crownsor Fillings can treat cracks and fractures. Infected tooth pulp can cause severe pain. It occurs when the internal tooth root has been damaged beyond repair. Root Canal Therapy removed the infected matter and flushed the area to remove any infection or bacteria and then fills the area with a Filling Material. This will reduce the risk of it occurring again and strengthen the tooth structure. Sometimes metal fillings can cause cracking and breaking of teeth and cause headaches. White composite fillings are a reliable alternative to metal fillings and can be capped with a porcelain crown to ensure longevity. Old fashioned metal caps/ crowns can often appear dark and black around the gum line. These crowns can be replaced with the modern non metal crowns to mask the appearance of the dark line. 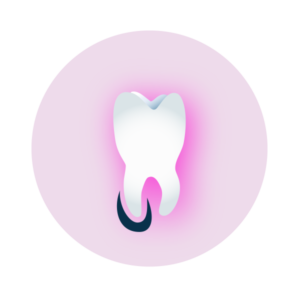 If designed carefully, the modern crowns can appear so natural that it’s hard to spot the difference between and natural tooth and a capped tooth!